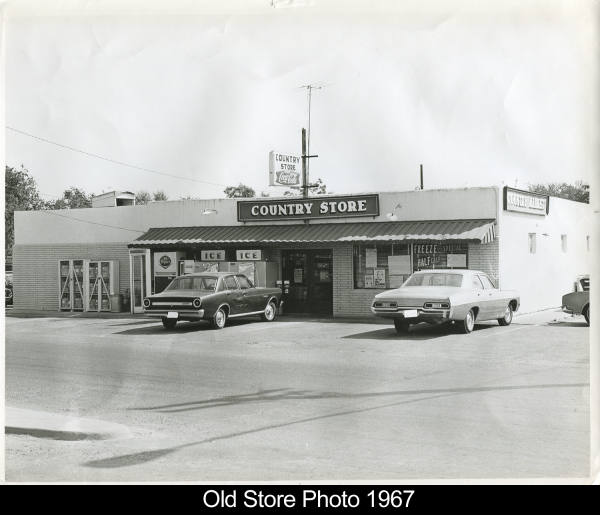 John Elder, a native of Karnes County, took over the ownership of the Country Store and Market with a partner on Jan 1st, 1961. 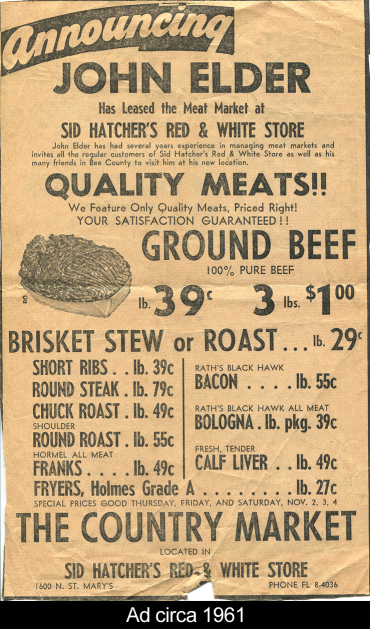 The business was purchased after John had experienced 2 years in the butcher shop under Mr. Sid Hatcher’s ownership of "Sid Hatcher’s Red and White Store." 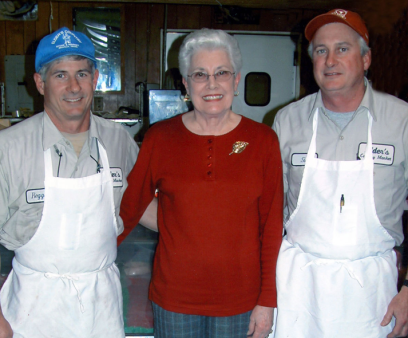 Previously, as a youngster growing up in Karnes County, John had worked at grocery stores, and then in Beeville was employed by Alvin Geisler Grocer, Rudolph Mueller and Foster Packing plant. 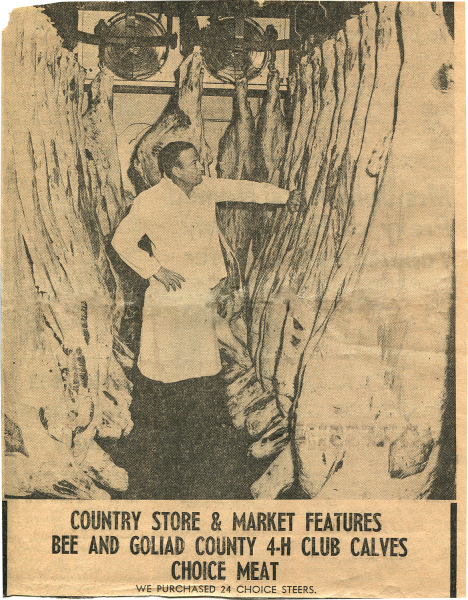 John’s full ownership of the store came in 1965, and the store became "Country Store and Market." 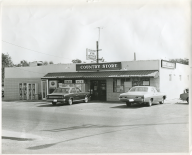 In 1982, the business was incorporated and "Elder’s Country Store and Market, Inc." was born. It has been operating in the same location ever since, a very high-profile corner at the intersection of St. Mary’s and Washington Streets, 1600 N. St. Mary’s Street in Beeville, Texas. Transformations of the physical building of the store have taken place through the years. 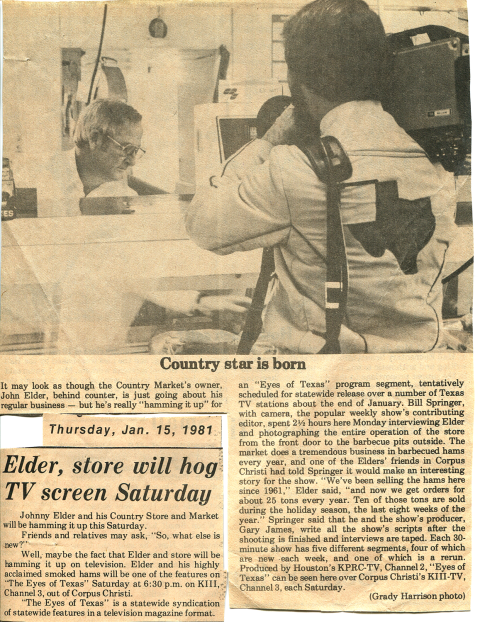 What hasn’t changed is the consistency of excellent meats and related services and products, making the store featured in an "Eyes of Texas" television segment in 1981. In the year 2000, an article highlighting the Elder’s beef jerky was published in the well-known cooking magazine "Saveur" as one of the year’s "bests". 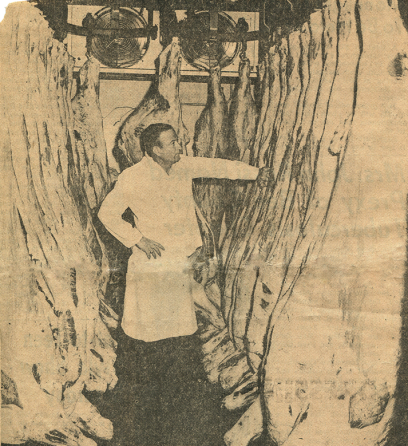 Before John’s passing in February 2004, a number of awards and honors were bestowed on the "left-handed butcher." John received the Sam Walton Business Leader Award and the Kiwanis and Key Club Vocational Service Awards. John was also crowned Mardi Gras king for the annual event held to benefit St. Joseph’s School Scholarship Fund. For many years, the store supported the annual Knights of Columbus St. Joseph’s Church Barbeque to benefit St. Joseph’s School, where all of his 5 children attended. 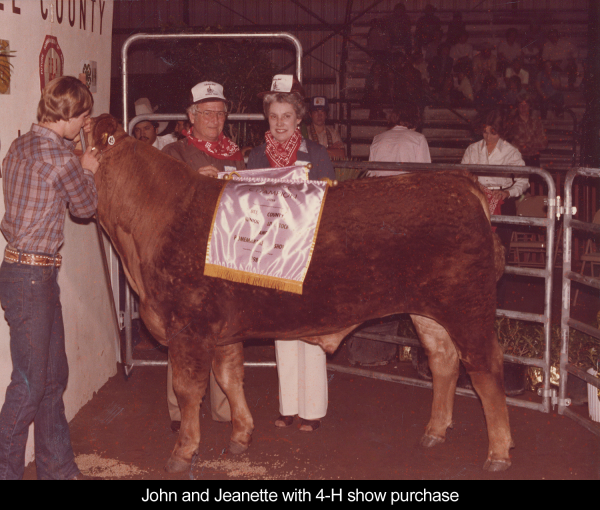 He and Jeanette (Windberg), a native of Goliad, were active in supporting the 4-H Junior Livestock and Homemakers Show, having purchased prize livestock at numerous annual show auctions. 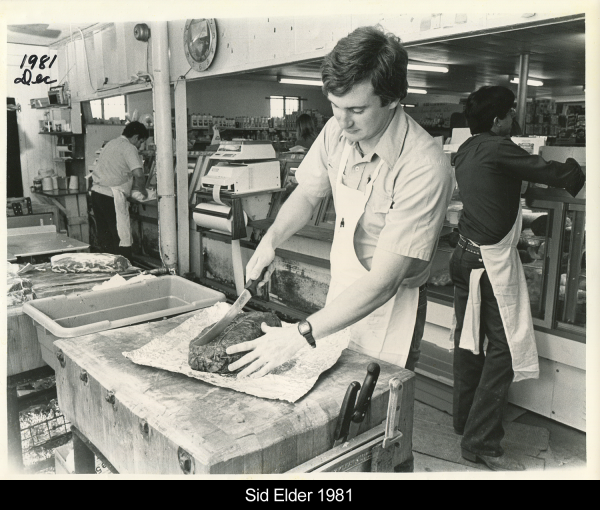 John and Jeanette’s two older sons, Sid and Reggie, continue on as Elder’s market owners and operators of the Country Store and Market. In their support of community events, the business continued to support Key Club and local soccer league benefit barbeques through the years, often known as the Sunday "drive-thru" at Elder’s, until other fundraising efforts took place. Annual support of the 4-H Junior Livestock and Homemakers Show mentioned above continues. Jeanette remains active with ordering and bookkeeping duties at the store weekly. The Elder children, including sons Reggie and Sid mentioned above, along with eldest daughter Phyllis, daughter Brenda and youngest son Daniel, all worked at various times during their Beeville schooling years. In addition, Elder grandchildren can currently be found at the register, working during their college breaks. 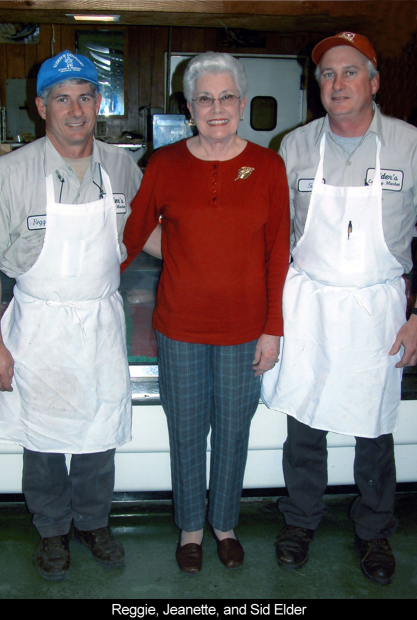 As active owners, the Elder sons are always available at the counter in the butcher shop, keeping the family tradition of providing the highest-quality meats for their customers. Family and friends’ recollections of John continue to amuse many, with laughter often resulting from sharing John’s stories and tales. 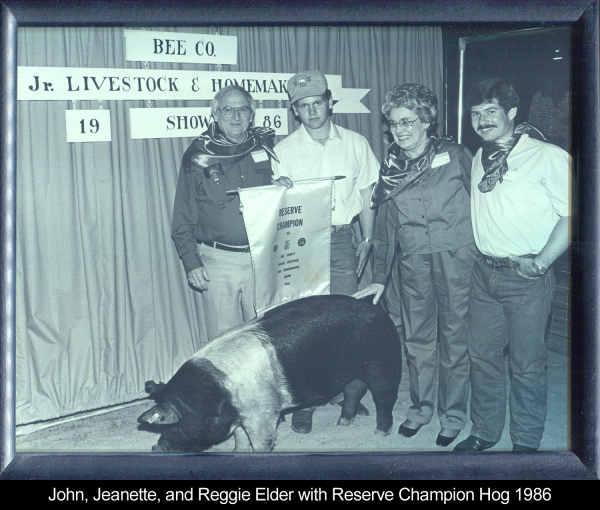 John’s love of the community of Beeville, South Texas and the Country Market’s customers has been visibly passed onto the next generation currently operating the Elder family business.